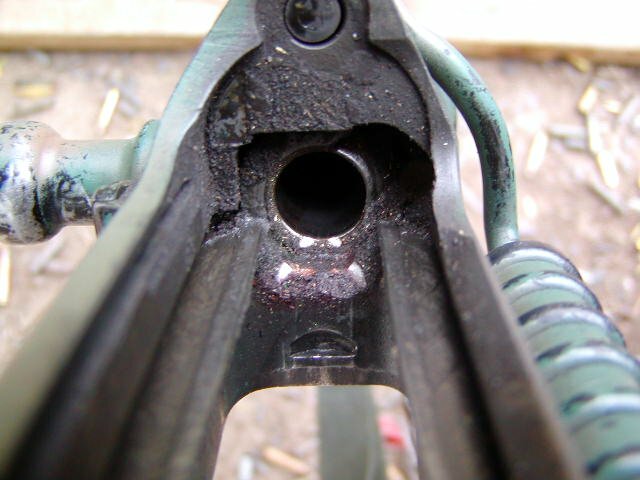 ﻿ HuntingNut » Forums » General » General » How often do you clean your rifle? How often do you clean your rifle? Posted: Fri May 16, 2008 4:09 pm Post subject: How often do you clean your rifle? Perceived wisdom is that a firearm should be cleaned every time you shoot it, or else accuracy & reliability will suffer. Some people however don't see it that way - like a certain FN FAL owner who hasn't cleaned one of his rifles for 14,320 rounds & five years. I've seen this rifle with my own eyes & the photo doesn't do justice to just HOW 'orrible it looks, as maintainence consists of adding more oil to the gunge already in residence. Total malfunctions during this time amount to ONE failure to eject on a very cold day with the first shot. Accuracy is still the original 2 MOA, despite the barrel having seen an estimated 20,000 rounds fired by the present owner, never mind those fired by whatever military it originally belonged to. Posted: Fri May 16, 2008 4:17 pm Post subject: Re: How often do you clean your rifle? Darn now thats bad! I clean every time after shooting and then again when I am bored. My eyes went to the spent brass on the ground under your picture though,,,, I started drooling thinking of brass to reload. Posted: Fri May 16, 2008 4:21 pm Post subject: Re: How often do you clean your rifle? Posted: Fri May 16, 2008 4:34 pm Post subject: Re: How often do you clean your rifle? Thats pretty bad. I clean after every range session. Posted: Fri May 16, 2008 5:59 pm Post subject: Re: How often do you clean your rifle? I also clean after every trip to the range. Some times I take my stuff with me to the range and clean it on the bench when I'm done if no one is waiting to get a spot. The only time I will hold off is during deer season, I wait till the season is over and then give her a good cleaning. Posted: Fri May 16, 2008 6:34 pm Post subject: Re: How often do you clean your rifle? Posted: Fri May 16, 2008 7:02 pm Post subject: Re: How often do you clean your rifle? A decision was made by the owner of the rifle to see just HOW the FAL stood up to a lack of normal maintenance & is a deliberate action, rather than bad practice. I fly out to the US on Monday & should see Old Dirty in action again whilst I'm over. Posted: Fri May 16, 2008 7:04 pm Post subject: Re: How often do you clean your rifle? My rifles get over cleaned apparently. If I brought home a rifle that looked like that I'd be spending alot of TLC time with it. Posted: Fri May 16, 2008 8:12 pm Post subject: Re: How often do you clean your rifle? I clean when I came back from shooting, and swab the barrel just before I go. Posted: Fri May 16, 2008 8:19 pm Post subject: Re: How often do you clean your rifle? Posted: Fri May 16, 2008 9:19 pm Post subject: Re: How often do you clean your rifle? All of my guns get cleaned after even one shot. If a gun of mine isn't shot for a month, I clean it anyway. I have taught my kids that when they get in from hunting, they take care of the hunting dogs first, then clean the guns, then worry about themselves. Posted: Sat May 17, 2008 2:17 am Post subject: Re: How often do you clean your rifle? ugh I clean a musket after one shot and a scattergun after 5 rounds. Posted: Sat May 17, 2008 2:18 am Post subject: Re: How often do you clean your rifle? Posted: Sat May 17, 2008 2:44 am Post subject: Re: How often do you clean your rifle? I'm like Bushy....one round is dirty and its cleaned....well thats my centrefire rifles and shotgun. At the range, when I have finished shooting I swab the barrel with Sweets, pull it through until I get a clean patch, take them home and do it all again. I am trying out an idea I think I may have read here with my rimfires...just clean them every 5 or 6 outings.....hasn't affected accuracy in any way, although I do feel guilty for not cleaning every time. Tell ya what Mike...be very interesting to have a look at the Gas Plug and Gas Piston on th FN FAL....thats if you could even get them out, as the gas chamber is probably chockers full of carbon. Posted: Sat May 17, 2008 9:23 am Post subject: Re: How often do you clean your rifle? I was afraid that picture might send Dimitri into convulsions! I try to clean after every range session but have to admit that it doesn't always get done right away.